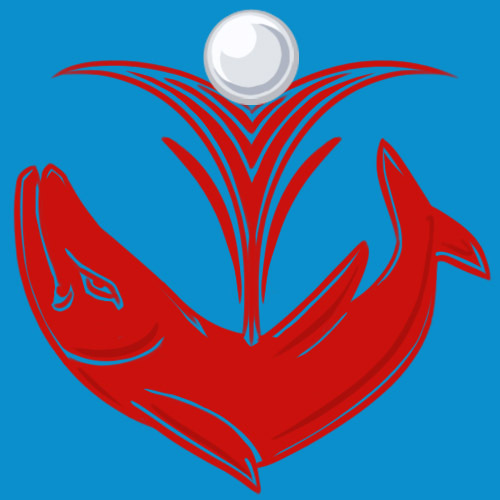 On a field Azure, a spouting whale Gules supports a pearl Natural. The whale and pearl showcase the main exports of the House, while the colour red stands for the Morfilods' famed vigour and vitality (and fertility). The arrangement of the charges forms an anchor, symbolizing their industry both above (merchant ships) and below the waves (salvage operations). Morfilod is a minor house whose lands are within the rich whaling waters near the border with Minos. Their frontier holdings and dangerous industry make them a weathered, coarse family that are often seen as rustic. Underneath the rough 'Sea Cowboy' exterior, however, they are shrewd merchants. Morfilod is unusual in Rebma in that its members are known for being copiously fertile. As such, three main generations of Morfilod nobles who still live on the family holdings number over fifty members, not including spouses and under-aged progeny. In addition to the undeclared Morfilod offspring living and working in the villages within the territory, there are countless other bastards scattered throughout the Golden Circle, for adventurous family members are strongly encouraged to sow oats elsewhere if they must, but to leave half-breed offshoots in the Shadows where they were sired. There are a few notable exceptions to the rule, usually politically motivated. The Morfilod family has quite a long history of filling the military ranks with their strong, able-bodied kin. Both their coming forward in times of war and various members' career service was acknowledged and rewarded by Queen Moins midway through her reign, by raising their line to noble status. Countess Carin Morfilod is the eldest daughter of the late Count, Rees Morfilod, who recently died due to wounds taken while shark hunting. The House's matriarchal trend would seem to be relatively short-lived as she has named her eldest son Salin to be her successor. Recently Morfilod has been moving into politics due to public acclaim of various Morfilod achievements from the Regent of Rebma. Morfilod maintains a large territory near the Minosian Shadowpath, and the Seas in that area are populated by migrating pods of whales, perhaps due to the farmed fields of tasty plankton and sea oats. Every product from high-fat milk, to meat and blubber, to bone and oil, and also ambergris, are harvested from their hunting parties and supplied to buyers throughout all the seafaring realms. In addition, they run a thriving pearl seeding and harvesting operation within canyons on the stratum holding. A smaller exotic fish farm is worth mentioning, as is the salvage business run by some of the younger nobles in lieu of ranching. There is no town estate to speak of in the capital, as the ranching family had no use for Court politics, up until quite recently. Now, they are looking to acquire property in the Upper City. They maintain a consistent client base throughout the Golden Circle with a small fleet of merchant galleons. The coarse ways of the family have always made them somewhat of a quiet joke amongst the other Houses, however Morfilod provoked the enmity of the Ygraynes when Baron Salin stood up in Open Court and pushed the merits of raising Morfilod to Major status, at the expense of House Ygrayne due to recent scandals. Their standing with the Crown is currently very good, despite the Regent's declining to elevate Morfilod's status. Due to the close proximity of their ancestral territories, there has always been an understanding of mutual interest and neighbourly defence between the Morfilods and Dafydds. There is a long-standing rivalry with Minos over whaling concerns, since the same pods seem to somehow migrate between Minos and Amber seasonally, flocking around Morfilod's nutrient-rich territory. Morfilod has in the past fostered good relations with Begma, accepting mechanical innovations within their territory and industry. They even hosted a visiting Engineer while he studied aquatic and specifically Rebman materials in the depths, and allowed one of their nobles to marry and go away with him to live in Begma. It ended in tragedy, however the ties with Begma were salvaged along with the Engineer's masterpiece, a Rebma-friendly Begman Submersible. A marriage contract was approved by the Regent between House Morfilod and Amber's Great House Karm, and the betrothal between Baron Salin and Lady Elizabetta Karm has been announced, although no wedding date has been set. A career or term within the Military (undersea) or Navy (surface). Sample Morfilod Family (Kelp) Tree shows the scope of the official noble lines, not including spouses or numerous under-aged or unrecognized spawn also residing within the territorial holdings. Enid - A Skilled Mirror Mage and Daughter of Dryssana, appointed as Trade Representative to Amber and the Golden Circle. She lives and works at the Rebma Embassy in Amber. Merrisol - Recognized by the Court as the son of Lady Petra. He has risen through the military to the rank of Lieutenant-Colonel, and commands a submersible for the Rebma Navy. He has been appointed to Warden of the Deep, a newly-created non-military commission to look into the realm's deep water concerns. Salin - First born son of the Present Countess, named heir, and appointed by Martin as the Rebman Ambassador to Amber. Currently on extended leave due to his betrothal to a Karm, he appointed his Deputy Dame Ryika Ygrayne as Acting-Ambassador in his absence. Fang - Great-granddaughter of Dryssana, from a well-mixed bloodline. Maddock - Enid's brother, former Captain of the Embassy Guard. Effie - Younger Rebman studying abroad. Vernon - A younger brother of the present Countess, high-ranking in the Rebman Navy and now overseeing Palace security. Lady Petra Morfilod, a mirror mage and one of the Countess' neices, married a Begman and lived happily away from Rebma for 28 years before calamity struck. She now lives at her sister Marilla's village home on the ancestral property, her mind quite slipped away. Lady Rilla Morfilod, daughter of Lady Marilla, a rowdy lass who has caught Big City Fever after attending Cousin Merrisol's wedding celebration. Countess Carin Morfilod, the proud Countess, has become more visible outside the County as of late, due to her House being pushed into the limelight by various auspicious events. Lady Dryssana Morfilod, the late Count Rees' sister, High Priestess of Lir, and extremely old and wise and creepy.